There are not many details distinguishing the Confederates from the Union soldiers in many of portrait photographs - they really were from the same country, the same culture. One of the differences that you do find is the less uniform appearance of Confederates: they are much less standard, often wearing bits and pieces of cast-off Union Army uniforms and often, even weaponry. One thing that’s specific to the Confederates is huge Bowie knives, humorously called ‘Arkansas toothpicks,’ often made by local blacksmiths. Pvt. Eskew was wounded in defense of Richmond, Va., early in 1865. Pvt. Skidmore was killed at Yorktown, Va. around May 1, 1862. Pvt. Altman fought in the battle of Shiloh, died April 23, 1863 from disease. Wm. Barksdale. Brig. Gen. Miss. Lt. Col. Weaver was killed at Murfreesboro, Dec. 7, 1864. 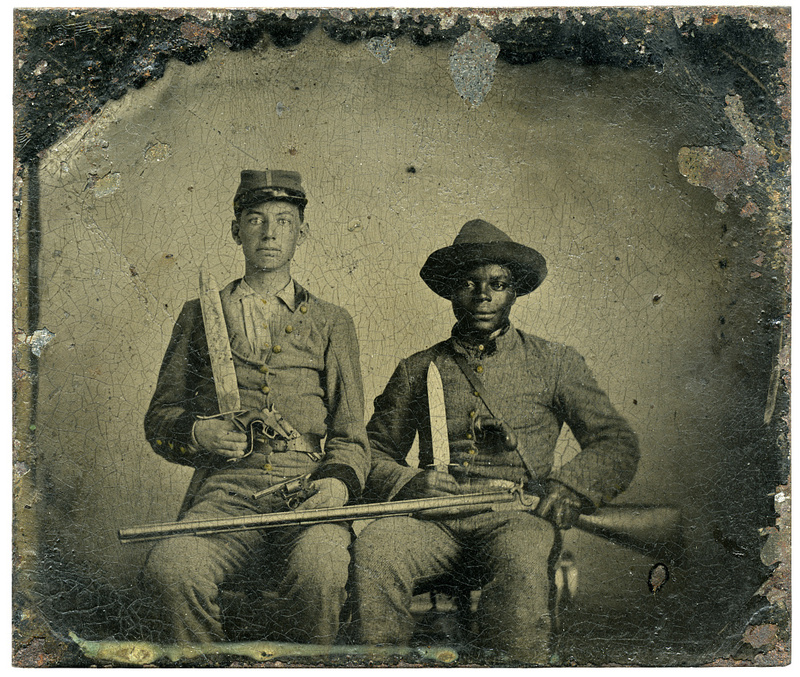 Photograph shows two identified Confederate soldiers. Photograph shows partially identified soldier. Photo shows identified soldier in Confederate uniform. Photograph shows soldier in dilapidated condition. [Captain Duncan N. Ingraham, Confederate States Navy, bust portrait, facing front] / D.B.C. ; photo. Eng Co. NY. Photo shows officer with photograph of man with top hat possibly from Quinby's Charleston studio. Photo shows identified soldier from Louisiana from either Co. D, 8th Louisiana Cavalry Regiment; Co. B, 28th Louisiana Infantry Regiment, or Co. B, 29th Louisiana Infantry Regiment. Photograph shows identified soldier, William Sharpe Barnes, who enlisted in 1861 as a corporal. Portrait photograph of identified soldier. Photograph shows soldier partially identified as David Bowman, ca. 1830-1883, or Michael Bowman, ca. 1842-1892; two manuscripts found with photograph.